So when 'Why can't we live together' by Mike Anthony was withdrawn, a new version was rushed out to continue the success story. This new version entered the Dutch Top 40 on April 17, exactly when the original version left the chart, and rose further to number 6. This version lasted eight weeks in the chart. Further information about this track is not available. Mike Anthony also disappeared from the music business, at least here in the Western world. 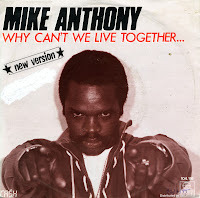 Mike Anthony entered the Dutch Top 40 on April 3, 1982 with his version of Timmy Thomas' 'Why can't we live together'. The chart run of this single was only two weeks, while in the second week it climbed to number 15. The Jamaican DJ ran into some legal problems with this single, as it used samples of the original recording by Timmy Thomas without consent. Within two weeks, the single was withdrawn and replaced with a new version. 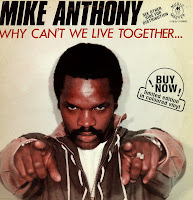 Jamaican DJ Mike Anthony recorded a version of Timmy Thomas's 'Why can't we live together' in 1982. The version caused some controversy when it became apparent that Anthony had used the original recording by Thomas. The single was retracted and re-released with new recordings of the music. This 12" single was pressed as a limited edition on white vinyl. The extended version on this disc is based on the original controversial version. The disc plays the same track on both sides.